U.S. labor secretary Thomas Perez gives insight into the August jobs report. 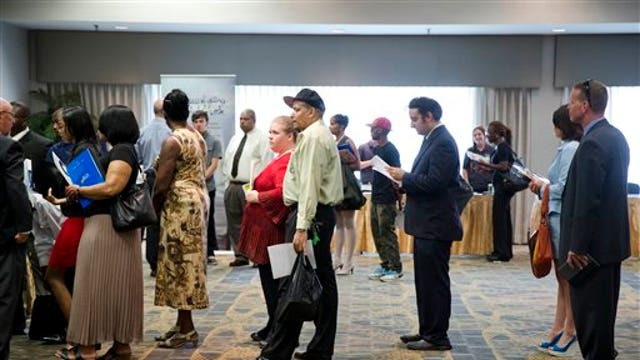 The U.S. economy added just 142,000 jobs in August, far below expectations as major sectors such as manufacturing, retail and transportation saw weak job creation. The unemployment rate fell by 0.01 percentage point to 6.1%, according to figures released Friday by the U.S. Labor Department. Analysts had predicted 225,000 new jobs and that the unemployment rate would drop slightly from its 6.2% level a month ago. Meanwhile, the labor force participation rate also fell to 62.8% in August, from 62.9% in July, another disappointment. The Labor Department also said job creation in June and July was 28,000 lower than initially reported. The disappointing labor report could force Federal Reserve policymakers to rethink plans for raising interest rates sooner than anticipated. "The report is a remarkable disappointment as a headline number, especially after receiving such promising macro data over the summer,” said Todd M. Schoenberger, President, J. Streicher Asset Management in New York. The tepid number of jobs created last month broke a string of five consecutive months during which more than 200,000 new jobs were created. Before the August numbers were released, the U.S. had averaged 209,000 new monthly jobs over the past year. Meanwhile, the unemployment rate has fallen more than a full percentage point from 7.2% in August 2013. Manufacturing employment was unchanged in August, following an increase of 28,000 in July. Retail trade employment was little changed, losing 8,000 jobs. “Employment in other major industries, including mining and logging, wholesale trade, transportation and warehousing, information, financial activities, and government, showed little change over the month,” the Labor Department said in a statement. Friday’s jobs report muddies the debate over whether the Federal Reserve will raise interest rates sooner than anticipated. As currently defined by the Fed, ‘sooner than anticipated’ would probably mean the first half of 2015, possibly as soon as the first quarter. Fed policymakers have made it clear that labor market data will be an important economic indicator used when determining when to raise rates. For months the consensus among Fed policymakers has been that rates will move higher no sooner than mid-2015. But that timeframe had begun to shift forward as economic data has gradually improved throughout 2014, particularly in U.S. labor markets. Central bankers have had a string of positive economic data to mull in recent weeks, including an upward revision last week of second quarter GDP growth to 4.2%, rising consumer confidence, strong gains in capital goods shipments, the strongest pending home sales figures in 12 months, positive back-to-school chain-store sales and unemployment claims coming in below 300,000 for three of the last four weeks. Earlier this week data revealed that U.S. manufacturing activity hit a nearly 3-1/2-year high in August and construction spending rebounded strongly in July, signs that indicated the third quarter is getting off to a strong start. But Friday’s report dampens much of that data. Another key element of Friday’s report from the Labor Department will be wage growth, which analysts had predicted would grow at a rate of 2.4% on a year-over-year basis in August, a slightly higher rate than in July. In fact, average hourly earnings rose by just 2.1%, falling below analysts’ predictions as average hourly earnings for all employees on private nonfarm payrolls rose by just 6 cents in August to $24.53, according to the Labor Department. Analysts and Fed policymakers will be looking at “wages, wages and wages,” said Mark Hamrick, who analyzes the economy for Bankrate.com. “People are happy to see stock markets rallying, home prices rising, and the value of their 401ks rising, but what really makes a difference is take home pay and we need to see sustained, steady improvement in that area,” he said. Hamrick noted that wages directly impact consumer spending, which comprises 70% of the U.S. economy. Wages have been essentially stagnant since the economic meltdown six year ago, offering justification to Fed policymakers who want to keep interest rates low for the foreseeable future to ensure against another economic hiccough that could set back the hard fought recovery. The Fed’s inflation ‘doves’ led by Yellen and new Vice Chair Stanley Fischer have pointed to stubborn slack in U.S. labor markets as evidence that the economy isn’t ready for the higher borrowing costs that will come with higher interest rates. But with the unemployment rate dropping and wages slowly moving higher, that argument is getting harder to make. Meanwhile, Fed ‘hawks’ such as Kansas City Fed President Esther George and Philadelphia Fed President Charles Plosser have been making strong public arguments in favor of raising rates sooner – possibly in the first quarter of 2015 -- as a deterrent to asset bubbles and runaway inflation.